There has been a serious lack of inspiration lately and I don’t know if it’s the heat, the fatigue from the move or just the unfamiliar surroundings. It takes a while to settle into a new place and even though in my head its home, it is still new and I am trying to get used to cooking in a smaller kitchen and then setting up my “photo studio”. It just all seems too much and hence the few and far between posts lately. I know having all the children home has disrupted my train of thought and things I plan are not happening accordingly. The schedule is all off, we get up late and go to bed late and I don’t like that. I still wake up bright and early but lounge around in bed so long because I am still tired and before I know it, the clock is signalling a ridiculous time! If that’s not bad enough, next week starts the Islamic holy month of Ramadan where all Muslims fast from dawn to dusk. I don’t know how I’m going to get up at 4am to eat and the lack of sleep will be a killer. I will talk more about Ramadan in the next post and maybe share one of my favourite Ramadan recipes. To get out of this funk I seemed to have slipped into, I decided to throw a party at my new place and invite all my favourite people. It was a kick off to Ramadan, when we can’t eat at all especially when we want to! It was a wonderful soirée, full of great friends, great conversation and good food. I made a bunch of Indian food because that’s what everyone expects and wants when they come to my house. I really would like to entertain with some French food or Italian or even good ol’ American, but then everyone will be disappointed. Out of the my invited friends, only one couple is of Indian Pakistani descent. I am sharing my most favourite meatball or kofte recipe which I made for my guests on Saturday night. I actually wanted to do this for the Daring Cooks Challenge this month but with all the craziness, I just couldn’t find time to participate. These meatballs are amazing, if I do say so myself. I don’t like to overly brag about my food 😉 but these are so good. Of course, they are Indian spiced meatballs so they may not work with your bowl of Italian spaghetti but as an appetiser for some cocktails, or in this masala, they are divine. They are quite versatile too, in that you can serve them dry with a dipping sauce, or in a tomato curry or this nutty and tangy curry full of South Indian flavours. My favourite way to cook them is to steam them a little until they are firm and then fry them. Cooked this way they are juicy from the steam and crispy from the frying. When I am going to drop them in a curry like here, I bake them off until firm and lightly browned. They are still juicy baked and I guarantee you will love them. No hard and dense meatballs here. Back in India, and the way my aunts make them, is to use roughly hand chopped lamb that is bound together, steamed and fried. Here the texture is key; slightly chewy, more of a meaty bite and the crisp exterior of shredded fried meat. I don’t make mine this way because of time. Also, chopped meat version is better with lamb which I don’t eat. I just use minced beef and call it a day. They are still incredibly tasty. One of the reasons I love them so much is their flavour and if you are a fan of cardamom, you will love them. Don’t leave out the besan (chick pea flour) because thats the other flavour that works in conjunction with the cardamom. In a pinch, you can dry roast some yellow split peas, grind them into a powder and use them in place of the besan. I should mention that the masala/gravy itself is very versatile because you can use it with beef, lamb or boiled eggs. I’ve never had it with chicken but I don’t see why you couldn’t. Traditionally, it’s made with pieces of lamb or mutton. That’s the way my mother used to make it and it was one of my favourite dishes (yes, I grew up eating lamb and now with some crazy smell and taste issues, I cannot stand it). It’s also one of those curries where you can decide if you want a runny gravy or a thicker, richer sauce. I chose to go with a thicker sauce for the meatballs but you can thin it out if you prefer. It’s a great accompaniment to biryani, plain white rice or some naan. Grease a baking sheet with spray or oil. In a food processor bowl, add the onion, cilantro, mint, green chilli, garlic and ginger. Add the ground beef to the bowl and process in a few quick pulses just to combine. Tip out the meat mixture into a bowl and add the spices and besan. Gently mix through with your hands. Shape into golf ball size balls, can use a cookie scoop if desired. Place the meat balls on the baking sheet. Continue until all the meat has been shaped into balls. You will get about 20-24 meat balls depending on the size. Bake in the oven until firm and golden brown, about 30-40 minutes. While the meat balls are baking, make the gravy/masala. Put a teaspoon of oil in the pan and on medium high heat, brown the onions. Keep stirring them so they don't stick and burn in the little oil. We don't want them caramelised, just a nice golden brown colour to them. They will remain quite soft still. While the onions are browning soak the tamarind ball in about 2 cups of water. After the onions have browned, take them out of the pan and let cool for a bit. In a blender or food processor, add the cooled onion and the chopped tomatoes. In the same pan used to cook the onions, add the oil for tempering. Heat the oil on medium and once hot, add the cumin seeds, the dry chillies and the curry leaves. Be careful because the seeds and the curry leaves will spit. Heat the spices in the oil for a couple of minutes and then add the onion and tomato paste. Add the peanut butter, tahini paste, cayenne powder, turmeric, coconut, coriander powder and fenugreek powder. Mix all the spices into the paste well and stir to make sure it doesn't stick. Once the masala has cooked and the oil is beginning to separate from it, strain the tamarind water into the pot or alternatively, add hot water and 2 heaping teaspoons of tamarind paste. At this point, add the meat balls. Reduce the heat to medium low and simmer the sauce until well blended, the meat balls are coated with the sauce and some of the water has evaporated. Depending on how you like the sauce, you can add more water to thin it out or simmer until it is thick. Make sure to stir gently so it doesn't burn. Also, check for the tanginess. Add more tamarind if desired. Check for seasonings and add accordingly. If you like a bit of sweetness to the tang of the tamarind, add a teaspoon or two of sugar and it should mellow it out. If you don't have peanut butter, dry roast a tablespoon of raw peanuts and grind them up and same for the sesame seeds, dry roast 2 teaspoons of sesame seeds and grind them. I always have peanut butter and tahini paste so I've started taking this short cut. The coconut is a desiccated non sweetened one. Don't use the sweetened flaked unless you want a very sweet curry (been there, done that). Curry leaves are also a-must because this is a Hyderabadi masala using nuts and South Indian flavours of curry leaves, coconut and tamarind. I want to wish everyone a very happy and safe 4th of July. I am sure there’s going to be some amazing cookouts this weekend and not to mention all those delicious cobblers, shortcakes, pies and cold treats. I made this dish on Saturday. Delicious!!!! I packed the leftovers for lunch so I enjoyed it twice more!, thank you! Thank you Paula! I am so glad you enjoyed them and thank you for coming back and letting me know, I really appreciate it. Not only is this dish stunning but so are the plates you used! I wish I could eat it up right now! Thank you so much Mary Frances! Thank you for stopping by! I’m salivating, and just demanded breakfast of CPoo after reading your post and studying the recipe. And I think your ‘steaming the meatballs before frying them’ tip is about to change my life 😀 I go through stages where I’m completely uninspired to cook – that’s usually when I grab a new cookbook or buy a particularly random ingredient and try to make it creative and fun again. Can’t wait for your post on Ramadan! Thanks Jas, yes, I go through those very periods. Usually when I am very tired I am uninspired to cook. The steaming and frying is a great method! Makes for lovely soft meatballs with gorgeous crispy exteriors. This meatball curry looks so hearty and amazing! I have to try this soon! Thanks Asmita! They are good so I hope you try them. I hope you get over the “funk” feeling soon! I know I would, with this delicious masala koftas! Thanks Kiran! I am getting there slowly. Jut need to let everything seethe down I guess. I’ve been running on high for awhile and need to relax. I like the idea of steaming and then frying the meatballs. I am sure going to try it your way. 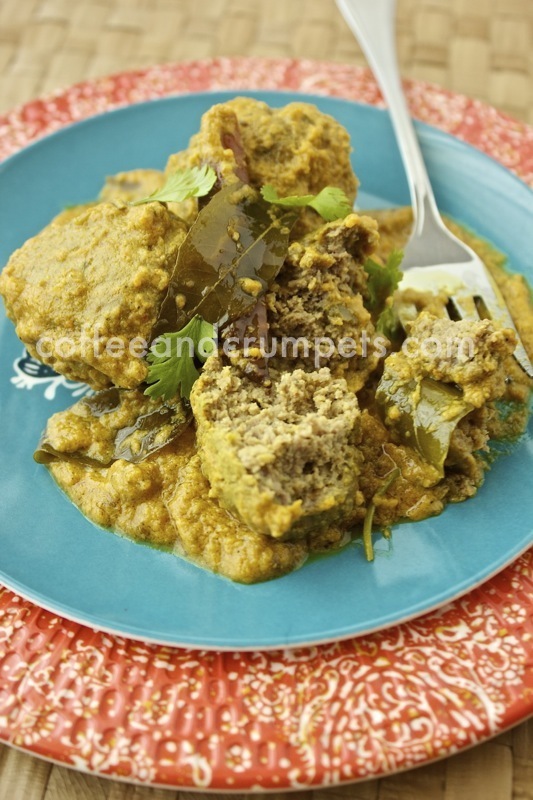 The recipe sounds very interesting with addition of tamarind, peanut butter and tahini paste. Have bookmarked it. Thanks Taruna! It is very flavourful and those particular uses are very common in Hyderabadi and South Indian cuisine. I hope you like it! Yep! And Ramadan is going to throw another spanner in the schedule! I’ll get through it I guess….very soon it will be time for school. OMG!Those meatballs looking heart-breakingly GOOD, honest and authentic ! Thank you so much for the fragrant, lovely recipe and photos. Thanks Nusrat! They are delicious if you ever try them! With just a bit of chaos, getting to cook is crazy, with the move, wow that’s a challenge. The curry looks so good, I adore the use of peanut butter. Btw can you believe, I’ve been following your blog for a long time but this is my first time commenting, I am a follower now. Ash-foodfashionparty recently posted..Chicken Wings – Spicy Masala Wings- turn up the heat!! Thank you Ash! I really appreciate it and thank you for commenting. It’s nice to hear from my readers even if its only to say hi! Nazneen, I am sorry to hear things are so hard right now!! I do not know what you are talking about with the photos, you photos are always beautiful, even the curries!!! These look absolutely scrumptious!! I hope that things will settle down for you soon!! Thanks Sarah! Things are good! I am just tired I think! Thank you for your sweet comment! Moving is such a hassle – hope you’re feeling at home soon. And now with your eating schedule being disrupted by Ramadan – it will be a challenge, I’m sure. Anyway, lovely dish. The idea of steaming the meatballs first is brilliant – that’s something I’m definitely going to try. Love all the flavors in this. It really is hard to photograph curry, isn’t it? But you did a great job! And the recipe is killer – thanks. Thanks John! Steaming the meatballs really helps keep the, super moist and then quick frying after takes care of the browning and crispy parts. Thanks for the comment! What a wonderfully comforting dish, I adore koftas! Especially in curries! Thanks Lin! It’s funny, I don’t like ground beef but love meatballs! What a lovely sauce, these looks absolutely mouthwatering! Such great spices in this. Thank Nat! It is tasty if you ever feel like making it. I can so identify with your post-moving feelings of exhaustion, Nazneen. So much planning goes into a move and then preparation for the move. Actually getting into your new home isn’t a finish line, only another step in the process. And you’re moving a family, too. It takes time for a house to become a home, Nazneen. Perhaps this, your first Ramadan in your new house, will engender feelings that this is now your home. I think you are right John. Once I’ve experienced Ramadan and then started the kids back to school, I will feel at home. I am at home now, I mean, my family is with me, but it’s the whole surrounding thing I think and the fact that I really was quite exhausted. I am getting there and having a party was very nice. To have your home filled with friends is always a comfort. Thank you for your kind words, you always have the right words to say! Your masala koftes look and sound finger licking! This reminds me of your baghare baingan and I would love to try the mix of peanut butter, sesame and tamarind in meat balls as well. Hi Balvinder, yes this is very similar to the Baghare baigan with the one difference being the addition of tomatoes in this sauce. Typically, this salan is a thin gravy when it’s made with mutton. It’s called mahekalhya..I don’t know what it means! But that’s the official name for this! Why unpack when you can make and devour this delicious dish my friend? Choc Chip Uru recently posted..Enhanced? Well, I kinda have to unpack…but I can do both…multitasking is great! These sound amazing. I love Indian cuisine! I’d love to try this sauce on some veggies! Thanks! You can definitely add vegetables to it or boiled eggs are good too. Ooh, I’m most intrigued by the cardamom in this but salivating over the entire dish…YUM! The Squishy Monster recently posted..Ch-ch-ch-chia! Thanks Angela! The cardamom makes the dish! Beautiful recipe!!! I just made something similar but it was in the form of kabobs. I wanted to tell you that your emails always go to my spam folder. Is crumpets a bad word somewhere in the world?!!! Thanks Mimi! I saw your kebabs and they looked great! My family is from Hyderabad in India and that region has a lot of Mughal influence and was one of the royal states with a lot of rich cooking. I don’t know about these emails…some of the ones I subscribe to I find go to my spam folder and I have to go in and retrieve them. I don’t know what to do to fix the spam issue. These meatballs look terrific, Nazneen! I so wish I could attack this plate — I guarantee they I’d have not only conquered it but I’d have returned it clean! Have a great week!!!! Denise Browning@From Brazil To You recently posted..Chocolate Pudding Ice Cream Pie: Happy Independence Day, America!!! Thanks Denise! I couldn’t resist them myself and kept popping them in my mouth. I think I ate the majority! Nazneen, the meatballs look mindblowing. I too can’t stand lamb – though I haven’t eaten them much even as a child, and I used to think I never developed the taste. I don’t cook beef, but mutton keema make for great kofta balls. But your gravy is what has me all excited – I am bookmarking this. I also have never used peanut butter – I am thinking you use it as a sub for groudnuts paste? Then it should also work in Baghaare Baingan…..has my grey cells all excited, hahaha! This works perfectly for baghare baigan! In fact I use peanut butter and tahini paste there too. I grew up on English lamb and maybe thats different. We don’t get English lamb here. Most of my family eats mutton though so you’d be ok using that. Oh these look far too ‘yummy’ not to be put onto the menu immediately! The recipe is already on my kitchen bench 🙂 ! Looking forwards to your Ramadan food suggestions too! And lack of sleep: ha!! I am watching the Tour de France in real time from Australia [for the 11th year: yes, a real ‘Tour nut’!] and have just ‘got up’ at 10 pm after shutting eye for about two hours: don’t ask me at what time in the morning the light will go off! Huhuh: this is only the 4th night and one’s sharpness in daytime is already beginning to dull 😀 ! Thanks Eha! I hope you like them! Wow! You are an avid Tour de France fan! I don’t think Ive ever watched it 🙂 I just hope the British guy wins again..I know that much. The last thing I wanted to do when we were amidst boxes in our new home was cook. Unpacking, washing everything, then cooking on top? I totally get your lack of motivation. This looks like some good ole comfort food. Your photos are great, no worries, the tastiest things are often the least photogenic. Here’s to your inspirational streak coming soon! Hear! Hear! I hope so too! I am open to any cuisine and I think this is really very interesting! I can’t wait to see your Ramadan recipe. Thanks Peachy! I think you’d like these. I am hoping to post some of my family favourites for Ramadan as long as I can get motivated and not so hungry! Nazneen, your story sounds so familiar to me! Though there are things that I like about my new house, it is taking me a lot of time to adapt to the new photographic setup. I compare all the time. I love the ingredients you used for the masala. Adding peanut butter is new to me but makes perfect sense. And the kofte curry looks absolutely smashing! Keep the recipes coming, your recipes and pictures rock! Thank you! I’ve ben replacing peanuts in my recipes with pb and it works out great!Tahini takes care of the sesame seeds needed. The photos are taking a bit of time these days even though I have lots of windows and great light, its just I haven’t got used to it yet.